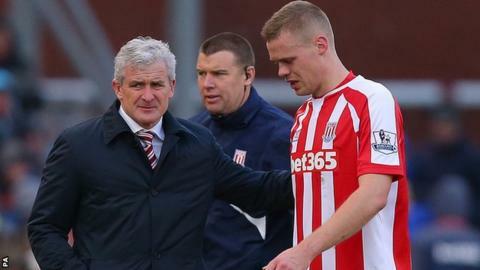 Stoke skipper Ryan Shawcross says that his team always knew just how good they could be and simply took time to gel after their expensive summer overhaul. After picking up just three points from their first six games, Stoke have now won successive matches to vault up to 14th in the Premier League table. "We always knew we were a good side. It was a case of waiting for it to gel," Shawcross told BBC Radio Stoke. "And, once we did, we've now shown that over the last couple of weeks." The 28-year-old defender has had to watch frustrated from the sidelines after missing the first two months of the season with a back injury. But, having been limited to just over an hour's action during Stoke's pre-season programme, he made his return for Stoke's Under-21's on Wednesday night, playing the first half of their local derby with Port Vale at Burslem. "I was a bit rusty," he said. "But this was another step on the road to full recovery and I hope to be back soon. The next step would be 70 minutes, then a full game. I've just got to listen to the medical staff and let them advise me. "I don't think Xherdan Shaqiri knows who I am. It'll be nice to show him I can play football. We've brought in some brilliant players and I'm just looking to get back involved."